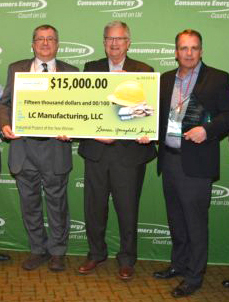 LC Manufacturing was recently awarded the 2017 Consumers Energy Industrial Project of the Year for improving the functionality and efficiency of our multiple air compressor systems. The improvements were achieved by installing updated Atlas Copco MKV Graphic controllers on our existing compressors and integrating the new controllers into ManagAIR®, a state-of-the-art system for monitoring and controlling air compressor systems. These updates enabled energy savings of more than $100,000 in addition to approximately $100,000 in energy rebates. Pictured left to right: LC Manufacturing’s George Stromski, Program Manager; Scott Smith, COO/CFO; and LCM President/CEO Pete Baenen. 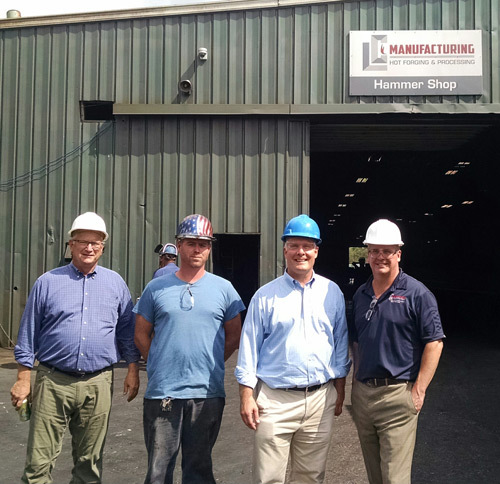 LC Manufacturing — Lake City welcomed a visit in August from Congressman John Moolenaar, 4th District of Michigan. Pictured from left: LC Manufacturing’s Scott Smith, COO/CFO, Nick Renucci, Manager of Forging & Maintenance, U.S. Rep. John Moolenaar, and LCM President/CEO Pete Baenen. The 1.3- to 3.3-kHz system is designed to heat carbon-steel billets 1.06-2.875 inches in diameter x 6-20 inches long to forging temperatures. The system includes automatic changing of frequency for differing billet sizes. The unit is loaded by a vibratory bowl feeder. The system includes automatic changing of frequency for differing billet sizes. The unit is loaded by a vibratory bowl feeder. A PLC with touchscreen display featuring ForgeView Plus software is also included. 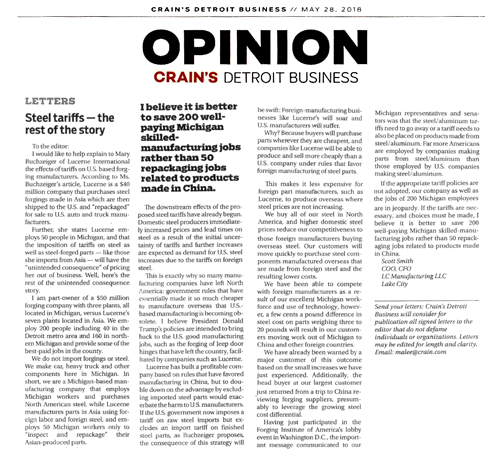 LC Manufacturing was named winner of the “Industrial Goods and Basic Resources Deal of the Year Award” by The M&A Advisor for their work with O’Keefe on the successful turnaround and sale of LC Manufacturing. The award was presented during the 2015 M&A Awards Gala on November 17th before a sold-out audience of accomplished business leaders and professionals at the New York Athletic Club, New York, NY. 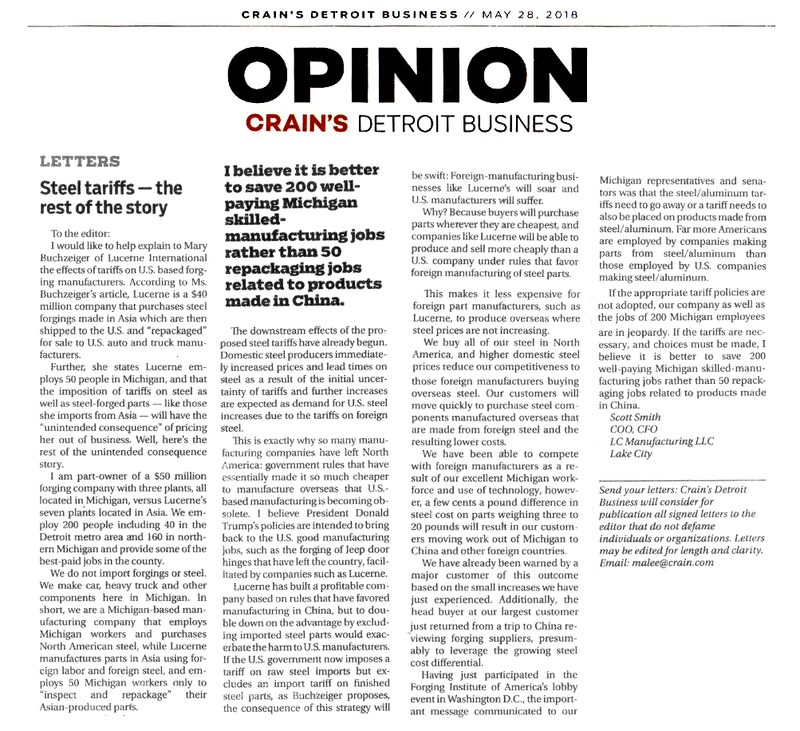 Since 1998, The M&A Advisor has been presenting, recognizing the achievement of and facilitating connections between the worlds’s leading mergers and acquisitions, financing and turnaround professionals. ABOVE – Receiving the 2015 M&A Advisor Award for Industrial Goods and Basic Resources Deal of the Year are (from left) Pete Baenen, President/CEO of LC Manufacturing, Roger Aguinaldo, Founder and Co-CEO of The M&A Advisor, Pat O’Keefe, Founder and CEO of O’Keefe, and Scott Smith, COO/CFO of LC Manufacturing.